We have built this house according to contemporary architectural art standards - and right from the beginning we cared about our future guests: people who are looking for a nourishing time out. People who dream of hovering in seventh heaven for a time, wanting to raise above everyday matters and to let eyesight float into a wide, quiet landscape. Also for people who want to play football, volleyball, badminton, or to chew blades of grass, watching nature without disturbance, unobserved, with their children and friends - on their own lawn, right in front of the house. Holidays in midst of nature. At the same time: perfect comfort, as you may expect in luxury hotels. Yet it’s all within your private walls. Double bathtub, double shower, pinewood bedroom, retractable home-cinema screen (95x63 inches), single terraces and a spacious living terrace, which becomes an extended living and family room in summer. And: space, space and even more space. From inside the house you can see into the landscape from every corner: the views from the windows are our most beautiful paintings. Upper floor: two master bedrooms, one with integrated bath / shower / lavatory and balcony. The second one is situated in a soundproof hanging cube and has an enchanting view down the valley. Ground floor: 7.77m room height in the large “Air.Space”. A communicative kitchen island from bulthaup with induction cooker, steam cooker, pizzabrick, Smoothie-Mixer, professional juice press, an Italian espresso machine for connaisseurs, fireplace with viewing window. A second livingroom with stainless steel design, fireplace is oriented to the north, yet light-flooded and comfortable, popular in hot summer summers or for a round of card games in decent winter afternoons. Garden floor: A complete luxury apartment for 2 persons with private bath / lavatory, terrace, an own entrance, but also accessible through the main entrance. In the northern part of the garden floor is a room that has been wisely furnished by our architect, so it generously invites up to 4 people in cozy Scandinavian beds. This room is particularly suitable for the youngest of the group / family, from young children to the growing sons and daughters together with their friends / girlfriends. High-quality colorful design furniture makes this room unique in its atmosphere of security. The guests of this room have a shared large bathroom with rainforest shower and lavatory. 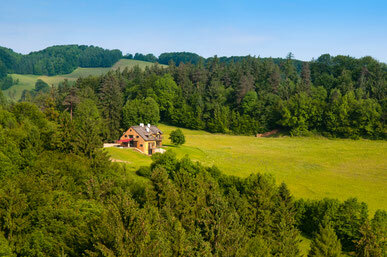 For those who like to move: from the front door of Phönixberg you can walk for hours on beautiful alpine pastures. The Pielachtal offers numerous hiking trails, the world cultural heritage nature park “Ötscher Torgräben” as well as the romantic Lunzer See (a romantic lake) are not far away. In the nearby village you will find an awarded restaurant. "Can you go on holiday here?" - "Yes, you can". Since we started, the Phönixberg has been booked for seminars and incentives. Now we have also opened it for private holiday guests. - The glow in the eyes of our seminar guests have convinced us. We look forward to being your host. The entire house is at your disposal. During your stay, the operator of the house or a house worker on call will be at your disposal. We are located in the midst of the romantic Landscape of the foothills of the Alps near the “Ötscher” (mountain), which offers a well developed ski resort in winter. In summer, you can make extensive hikes through the wild canyons of the famous natural park Ötscher Tormäuer. The river “Pielach” is one of the increasingly scarce river fishing areas in Europe. In order to preserve the high quality of the fish, licensing is strictly limited, early reservation is recommended. Right in the Valley of the Pielach, which is also called “Dirndl Valley”, you will find a wide range of hikes, last but not least to see the famous bushes of the Dirndl fruit, the delicious cornelian cherry. We are at the end of a 4 km long private road, which is closed for public transport and will be cleared in winter. For the use of the alpine road all-wheel drive is recommended in winter. Use is at your own risk. Parking is free for guests. At the bottom of the valley there is a stop of the private railway "Mariazellerbahn". On request we offer to organize a shuttle up to the house for our guests. If you want to walk to the house, you will need about an hour without luggage from the railway station.